Disney’s Animal Kingdom Lodge Resort is by far the most spectacular of all the Disney Deluxe resorts. 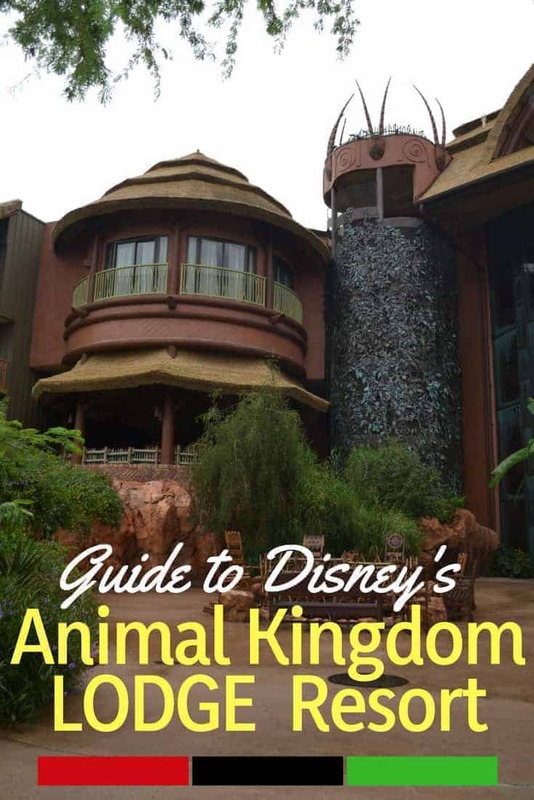 There are many reasons why Animal Kingdom Lodge is so popular among guests, but probably the most important of what sets this resort apart from other Disney resorts is that it is set on a 43-acre wildlife preserve. This allows you to experience the wildlife in its truest form all the while enjoying a full-on Disney resort experience. Disney’s Animal Kingdom Lodge Resort is divided into two separate resort areas: Jambo House and Kidani Village. Both Animal Kingdom Lodge Jambo House and Kidani Village have studio rooms and one, two, and three-bedroom villas. Each of these also has it’s own restaurants and pools, but the main hub of Animal Kingdom Lodge is Jambo House. 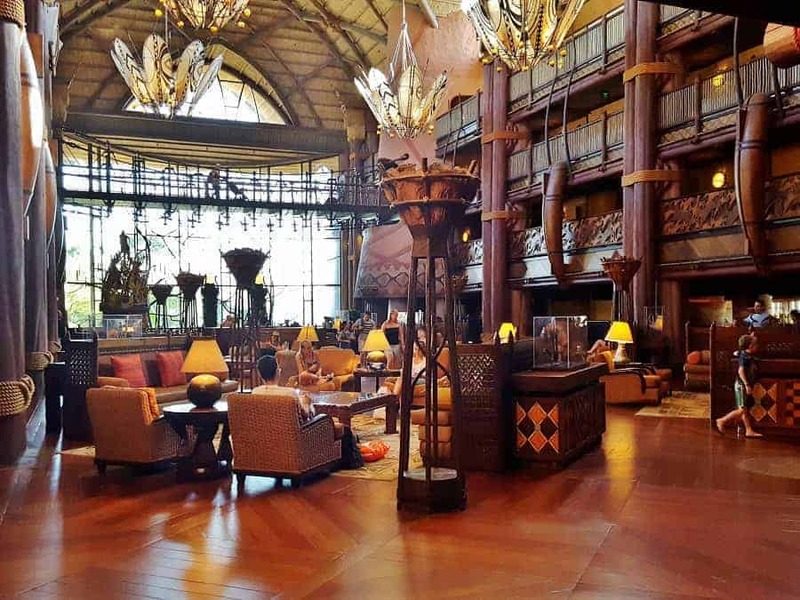 Designed by architect Peter Dominick, known for the Fort Wilderness Lodge, Animal Kingdom Lodge Jambo House makes you feel as if you are really stepping foot in an East African national-park lodge. The theme will be found in all aspects of the design of this resorts, from the carved designs in the woodwork to the lighting. Take a look inside the Savanna Rooms at Disney's Animal Kingdom Lodge Resort. Animal Kingdom Lodge has several different types of rooms, but the most popular is the Savannah View rooms. If you get the luxury of having a Savannah view room, you will be able to observe free-roaming wildlife right from your balcony. We’re talking giraffe, zebra, gazelles, wildebeest, okapi and more! Don’t worry, if you can’t afford the luxury of a Savannah room, you can go just outside the main lobby to an elevated rock platform to get an up-close view of the animals! Foodies will love the food options at Animal Kingdom Lodge. You will get the chance to eat at Animal Kingdom Resort’s 2 award-winning restaurants: Jiko- The Cooking Place and Boma, Flavors of Africa. 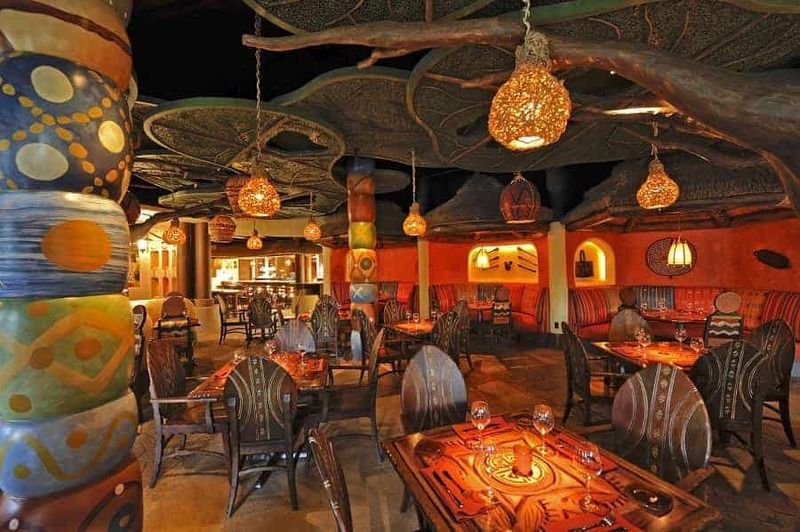 The signature restaurant at Disney’s Animal Kingdom Lodge is Jiko-The Cooking Place, features African, Indian and Mediterranean cuisine. You will find such dishes as banana leaf-steamed Chilean sea bass with asparagus puree, oven-baked garlic chicken tagine with grapefruit, olives and herbs; or a whole roasted papaya stuffed with spicy minced beef. Even the wine list is impressive. Jiko-The Cooking Place at Disney’s Animal Kingdom Lodge offers only wines from South Africa, the largest South African wine program for any one site in the United States. Every Wednesday, there is a wine tasting (reservations required) put on by sommeliers at Jiko – The Cooking Place. 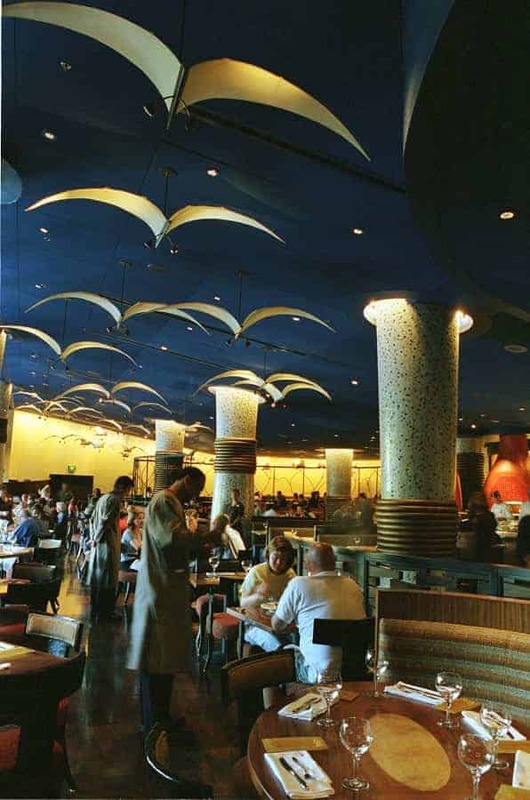 Be advised that Jiko – The Cooking Place is a signature dining experience so you have to dress appropriately. This is not the place to dine wearing a t-shirt and shorts! Boma’s breakfast buffet is pretty standard as far as Disney buffets go, but the dinner at Boma, Flavors of Africa is pretty fantastic. It features cuisine from over 50 African countries! You will find soups like hearty chicken corn chowder, entrees like slow-roasted ribs and whole-spiced chicken and side items like couscous, saffron rice and sweet potato pancakes. You will find fresh breads as well, like African-inspired golden-brown naan, light and flaky chapatis and a blue cornbread. If you are looking for a quick dining option, you’ll need to head over to the Animal Kingdom pool. Just past it is The Mara. The Mara, serves breakfast, lunch and dinner with everything from fresh soups and burgers to flatbread. We found them to be a wonderful treat when you want a quick meal or special treat (they have quite a selection of desserts including the Zebra Dome). Be sure to try the Chicken Pita with Sun-dried Tomato Hummus, Cucumbers, Tomatoes, Mixed Greens, and a Mint Yogurt Sauce served with Couscous. 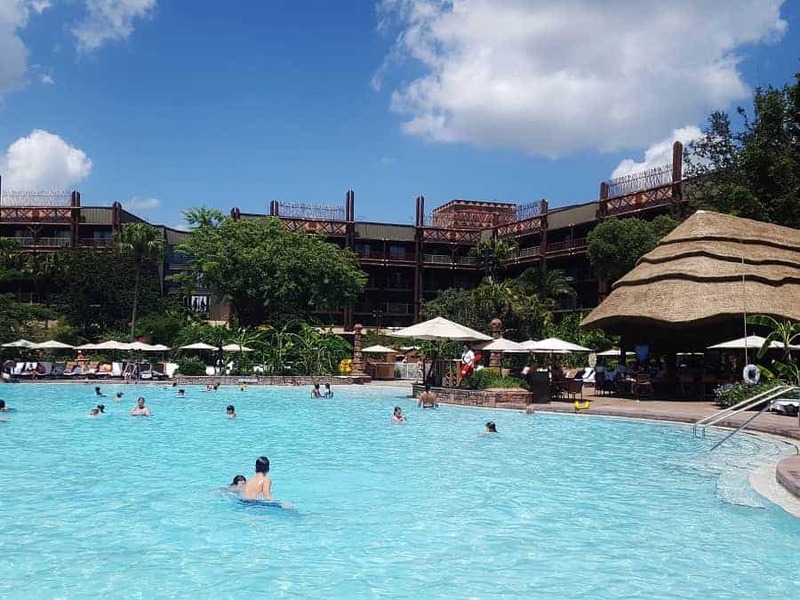 You will want to spend a little time lounging over at the Uzima pool located at Jambo House. This pool features a zero point entry, small water slide, and full service bar. The pool is very relaxing and also includes two whirlpool spas. 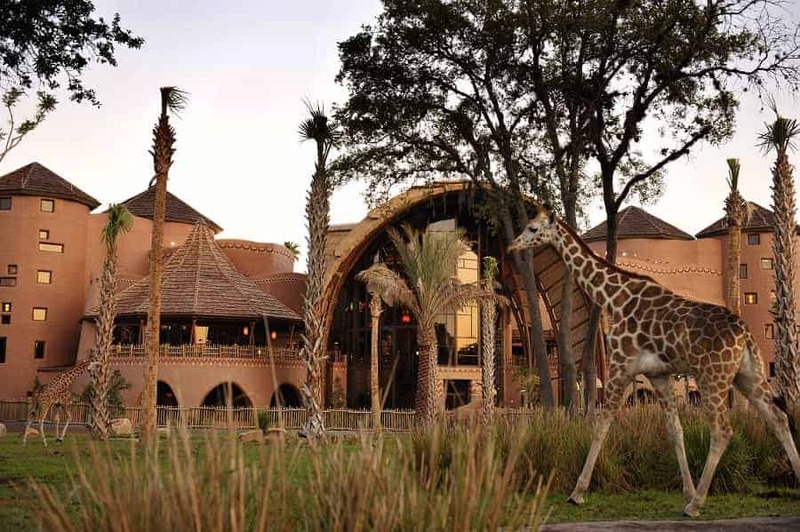 Kidani Village, a Disney Vacation Club property at Disney’s Animal Kingdom Lodge was inspired by the traditional African kraal (traditional African village of huts, typically enclosed by a fence). You’ll find many areas fashioned in a circular themed, with seating and room design. Rooms are very similar in styling to those in Jambo House with typical African themed bedding and decor. If you are staying in a studio villa, you will find a mini-fridge, sink, toaster, coffeepot, and microwave. 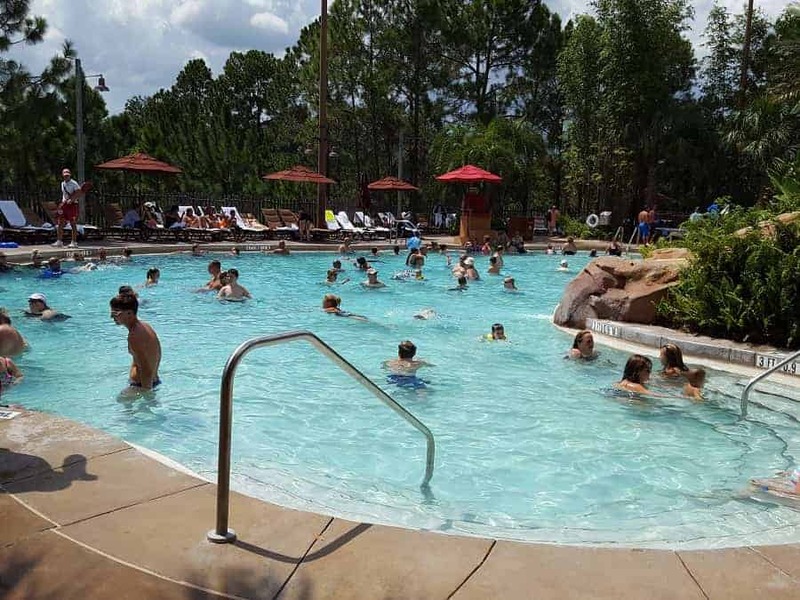 The Samawati Springs pool at Kidani Village is small, but nice if you just want a change of pace from the larger Jambo House pool. 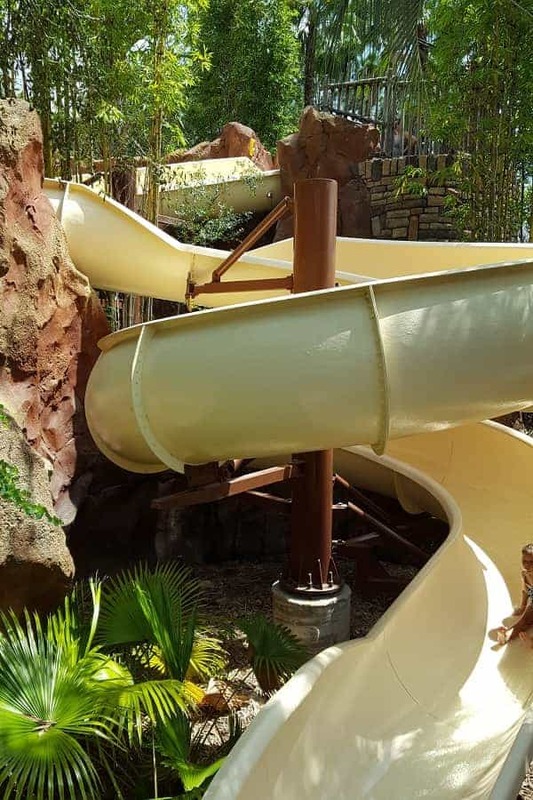 This pool has a much better slide than Uzumi, and the pool areas has kid-friendly features like a water-play zone and playground. You will find plenty of seating in the shade at this pool (and play area). One of Disney’s most sought after restaurants happens to be inside Animal Kingdom Lodge Resort. Sanaa is an East-African restaurant serving authentic African dishes with an Indian flair and sits right along the reserve so you can watch the animals as you dine. You will start your meal with Indian-style bread service that comes with 9 different accompaniments consisting of chutnies, hummus and butters. Be sure to try them all! Menu favorites include the Butter Chicken and African Triple Mousse for dessert. 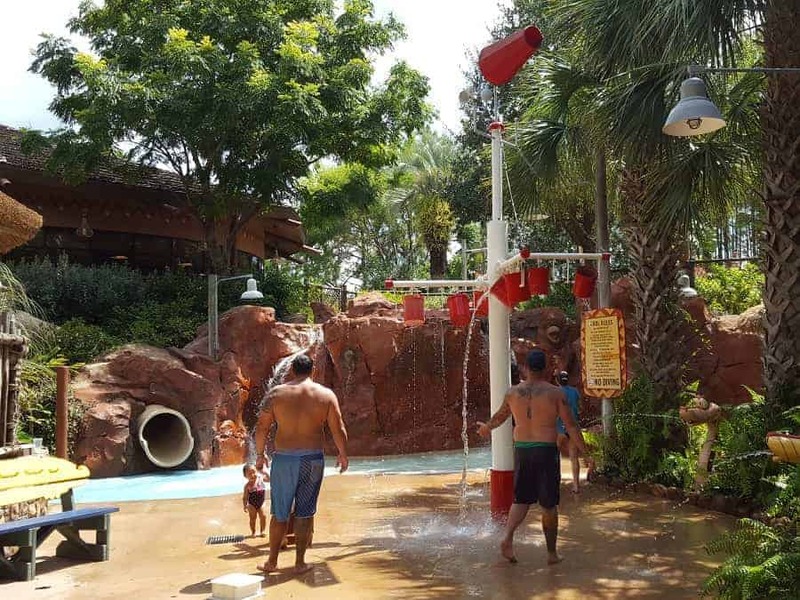 Families staying at Animal Kingdom Lodge will really love how many activities there are at the resort. Whether it is playing African drums, hearing stories old by African storytellers or roasting marshmallows, kids can stay busy during their entire stay. 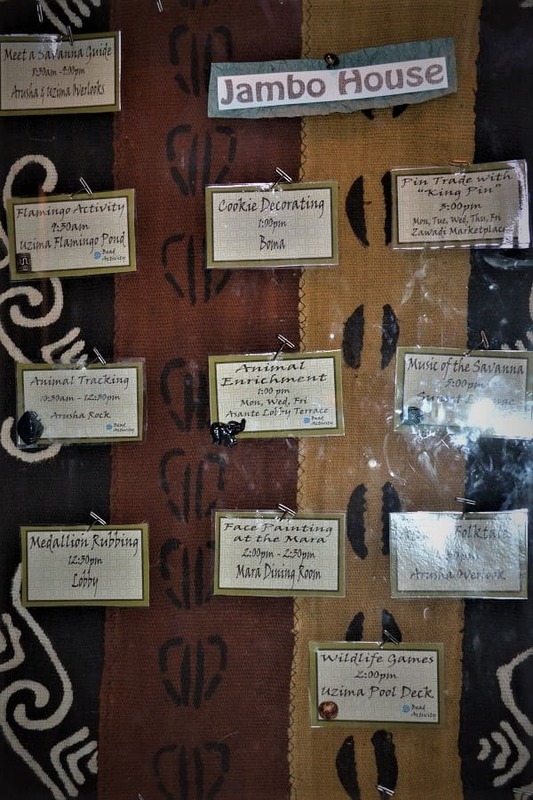 You’ll find a list of activities by the front desk and at the bottom of the stairs near BOMA. 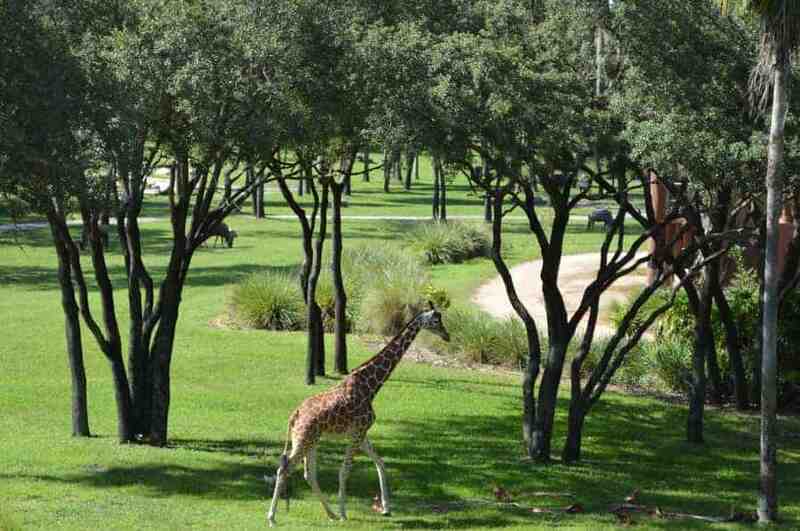 Disney’s Animal Kingdom Lodge guests can observe birds and animals during the Wanyama Safari. This 3-hour experience includes an excursion out to view the animals by safari vehicle and dinner at Jiko-The Cooking Place. The sunset safari will make you feel as though you have been transported to African with free-roaming wildlife in an authentic environment. 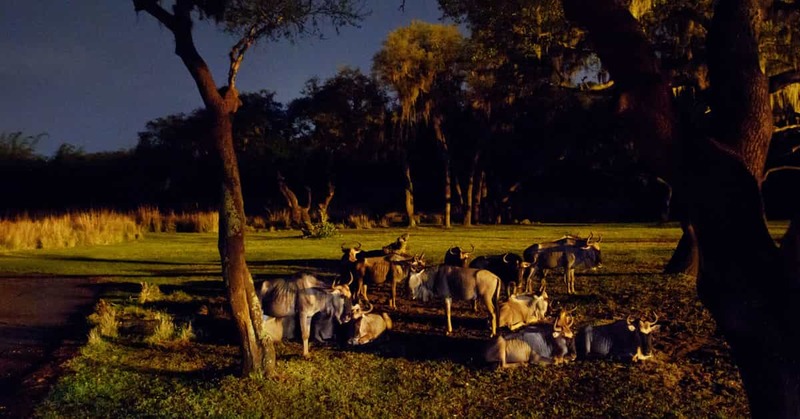 The sunset safari is offered seven days a week with a maximum of 12 persons per night so be sure to sign up for this as soon as you book your stay..
Take time to walk through the interior and exterior of Animal Kingdom Lodge Resort. There are many traditional African details placed in each & every place you go. You can even hunt for Hidden Mickeys, or browse the really cool African themed The Zawadi Marketplace gift store! 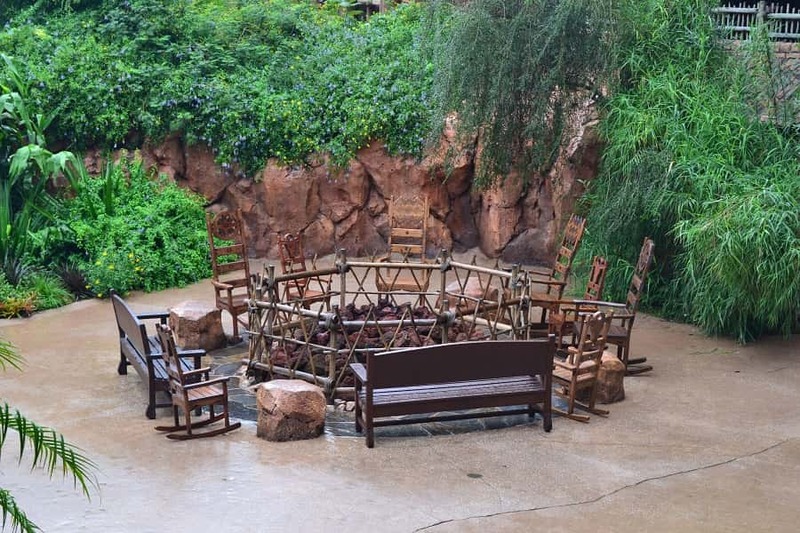 Have you been to Animal Kingdom Lodge Resort in Disney? What was your favorite part? This is so awesome! We’re going to Disney next month but staying at the Bay Lake Tower, I am going to check out the rest of your site for tips! :) Stopping by from SITS & soooo happy I did! I would so love to visit this lodge. Being so close to the wildlife is almost like being on a safari. I wish we had one in nearby Anaheim. stopping by from SITS. Never been to Disney and don’t plan to anytime soon but I think your blog would so helpful to someone who is going.I will try to spread the word whenever I hear of someone who if going. Definitely a nice option to go to a lodge with so much green space around. It would be a great way to decompress after spending the day in Disney park with so much happening. Thanks for the heads up. I’ve never heard of this part of Disney. Enjoy your SITS Day. We just returned from our first trip to Disney World and stayed at Animal Kingdom Lodge. It was beautiful, especially with the holiday decorations up. My kids loved the pool and being able to check out the animals right from our window! I am so jealous! The pool is one of my favorites! Thanks for stopping by! Exactly. You know, it is hard keeping the kids entertained in the room so having animals outside and a pair of binoculars works wonders! Loved, loved, loved Animal Kingdom Lodge when I stayed there. It’s so amazing to see all the animals at your hotel, plus they offer a chance to see them at night with night vision goggles. I wish I would have gone on that one. The pool is also amazing. I didn’t have a Savannah view, but I did a pool view and it was just as nice. It’s so beautiful at AKL. Just a minor correction. Sanaa is at Kidani Village, another table service restaurant, while Mara is actually in Jambo House (or at least it was in 2014). Mara is VERY GOOD for a quick service. Needless to say, the atmosphere is the best. I have stayed at three different Disney resorts (AKL, Caribbean, and Saratoga Springs) and this is by far my favorite. We are DVC members and animal kingdom lodge is our home resort. We visited Nov. 2016 we were in a 3 bedroom savanah view Suite , every morning we had coffee and breakfast with the animals . The view was spectacular the animals were amazing and right up close to our room. One afternoon the vultures were being fed below our balcony, the keeper answered all of our grandchildrens questions about the birds and his responsibilities as there keeper. We have stayed in many of the resorts but this is our favorite and why it is our DVC home resort! I recommend if you can stay here the exspirence is unforgettable and educational.